I often get asked to share my Paella recipe, so here it is for the world. This is according to my friends who have had the real thing in Spain, better than anything they have ever had! I developed this recipe over the last 10 years. Enjoy! 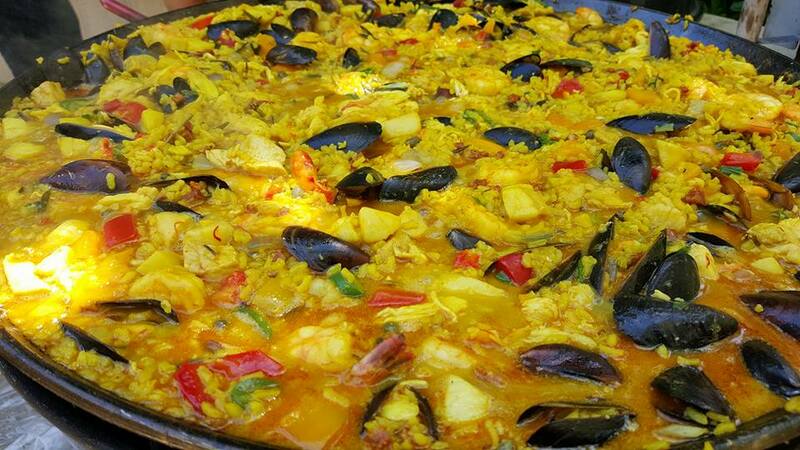 Neptune's Paella. I feast fit for the god himself! This is about a 250-350 dollar meal and takes 3-4 hours to prepare. I recommend making sure you have enough people to eat it, but if you don’t, it makes a mighty left over meal. I recommend having a helper to prep everything. If this is a new Paella pan, oil it with olive oil and cook for 1.5 hours at 450 to season the pan. Shell the prawns and add all the shells to the chicken broth. Use scissors to remove all the crab meat, add the shells to the chicken broth. Reduce the chicken broth in half. Strain out shells, set aside. Dice all the vegetables in medium to large dice. Dice all the meat in medium to large dice. You will need a grill, do this outside, get the grill hot as hell, lots of coals. Make sure its well burning. You need about 45-60 minute of burn time and you will not want to add coals once its started. Make sure you paella pan fits securely on your grill/fire before starting as its hard to do after. 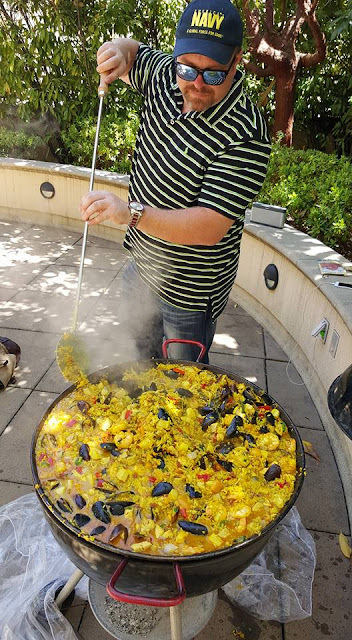 Take your seasoned Paella pan and add some olive oil and butter (enough to sauté the rice, dont skimp, its not healthy, get over it) to it bring it to temperature (Don't burn it! Be ready to add the rice quickly when its on a grill, within a minute), add the bag of rice. Sauté on the stovetop until the rice shows the first signs of browning (do not burn, error on the side of undercooked). Add the strained broth from earlier. Also add in the saffron Be careful, you are adding water to hot fat... let this cook for about 15-20 minutes. Stir it. Add water if need be so that the rice is covered. It will cook off very fast on a hot grill. The end goal is to get a slightly crispy crust on the rice but you have to give it a chance to cook first... this is probably the single most important thing you can do is get this rice cooking correct. now we will cook everything else, You should have some liquid left in the pan, the temp should be still hot but not out of control at this point. The idea is to not overcook the meats. Its easy to do. Its done when the juice is gone and the rice starts to carmalize on the bottom of the pan. On the grill, big spoon needed!